Just because you’re low on cash doesn’t mean you have to skimp on the birthday of your loved one, there are some great options to get birthday flowers for cheap! With the economy being in a tough spot these days, many are looking for ways to honor the special people in their lives without breaking the bank, and the floral community has answered the demand! We’ve compiled some of our favorite birthday flowers for cheap; all under $35! This adorable bouquet features gorgeous orange roses and gerbera daisies, flanked by dazzling yellow Peruvian lillies. These stunning flowers are nestled in lush greens and arranged in a lovely glass bud vase. To top off this beautiful display is an adorable little plush dog, hugging the vase. This is a perfect arrangement for a child, or that adult who still loves plush little toys. This an especially great option for those with June birthdays, since roses are the official flower for the month of June! Speaking of roses, if you want to focus on the rose for a June birthday, this single rose option is the perfect way to do so inexpensively. This arrangement of a vibrant red rose, accompanied by blades of lily grass and aspidistra leaf is stunning in its simplicity. A red rose is the rose of love, and to present it as a single flower signifies a deep love. This is a perfect way to show that special someone how much you love them on their birthday! If you want to bestow sweet mixed flowers for cheap upon a loved one for their birthday, this is one of our favorite options. Beautiful gilliflowers come in stunning colors of purple, peach, pink, white, yellow and red. 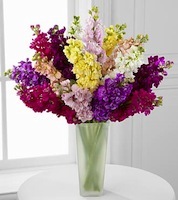 The gilliflower is known for its full, lush bloom, and this array of stems provides a beautiful, bushy look that is brimming with eye-catching colors. Remember that, if possible, you can’t beat delivering these flowers yourself, so have the flowers delivered to *you*, and go make someone happy!